As the sun sets, the Ozark Trillium releases a pungent, rotting apple-like fragrance into the air to attract vinegar flies. As they walk around the flower their legs track pollen from one plant to the other. 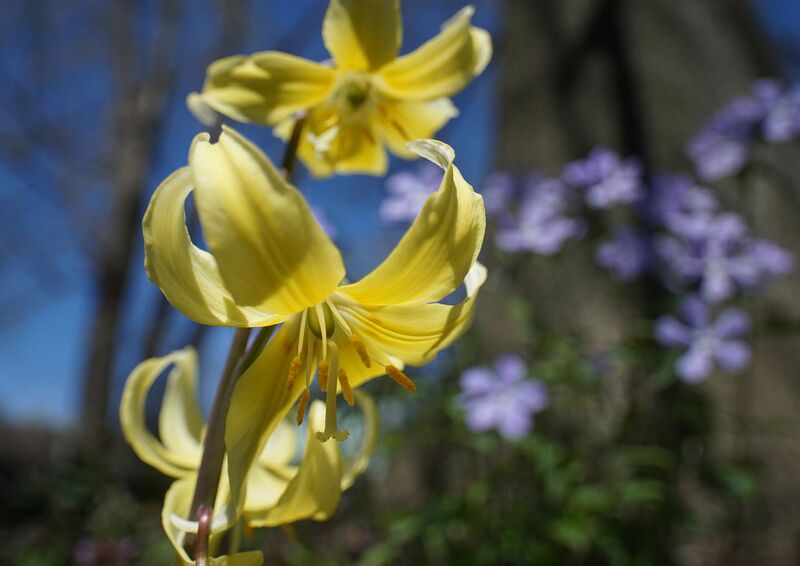 The earliest ephemerals have started to fade away. 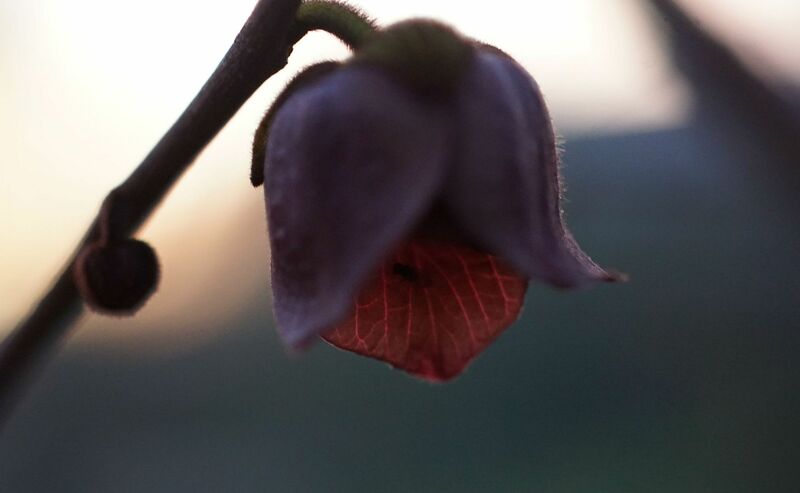 Plants that pushed up their blooms first are now dropping their petals to make way for new sets of leaves to produce energy toward generating seeds. 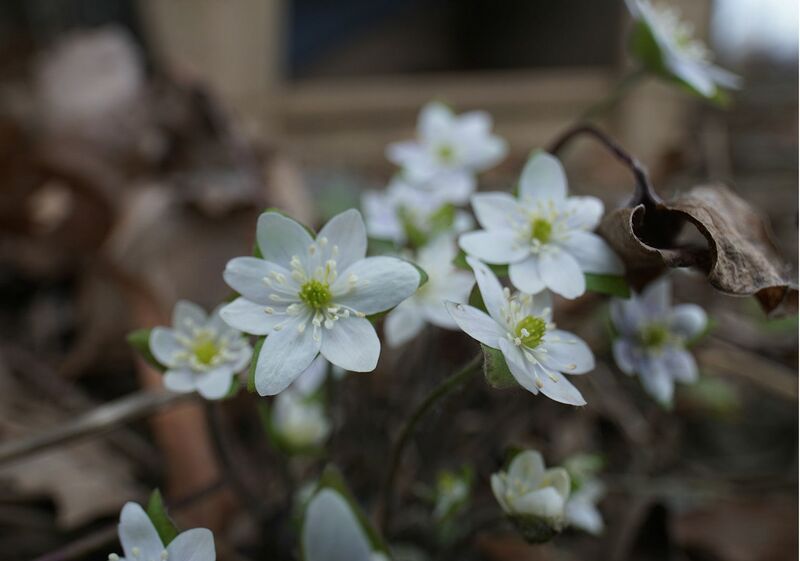 Here you see the last of my Twinleaf plants, which thanks to having multiple plants bloomed much longer than typical, though at no time was there more than one plant in flower. Clearly I need to plant them closer together so they flower within the same micro-climates. 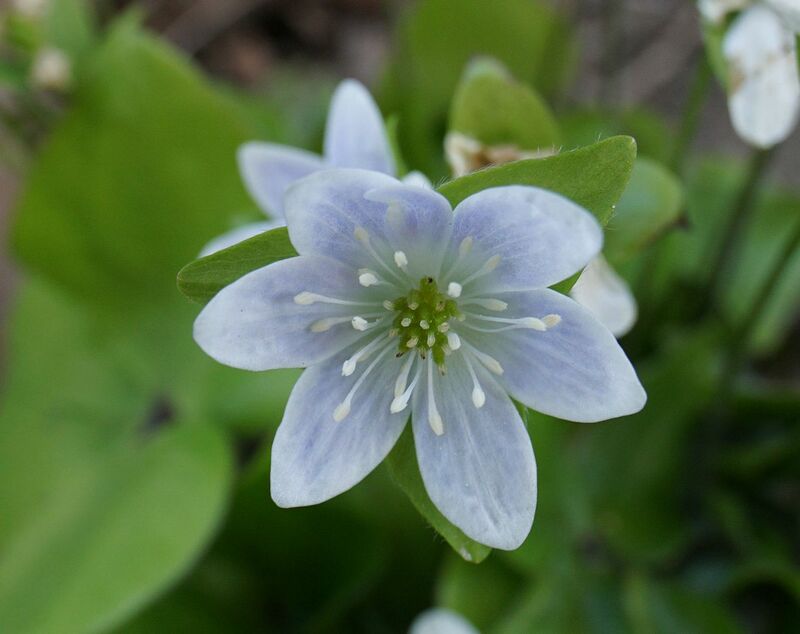 Hepatica is also saying goodbye to all of its petals. The green structures seen here in the center will inflate out into a sort of battle mace-looking structure, before falling apart into thin pointed seeds. 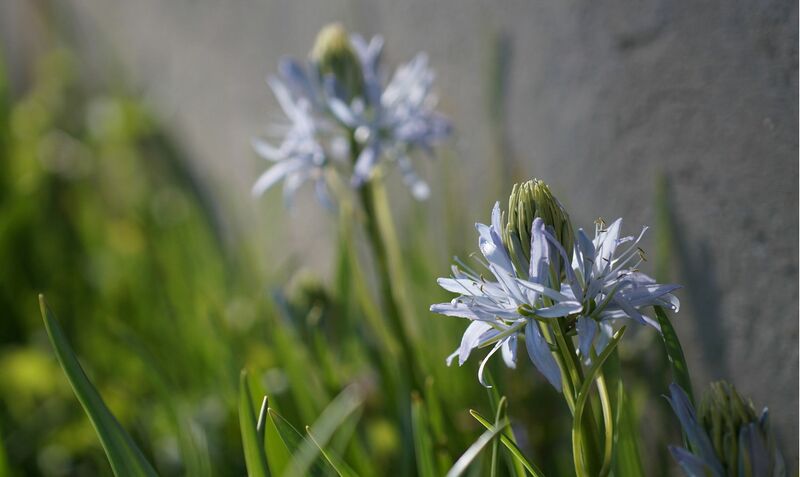 Wild Hyacinth is my new favorite bulb, and this year I went nuts planting it everywhere. We're still early in the bloom for this one so no pollinators yet. But I'm sure that will change when the several dozen or so that I planted out in the meadow garden start flowering along with the other patches I have about. 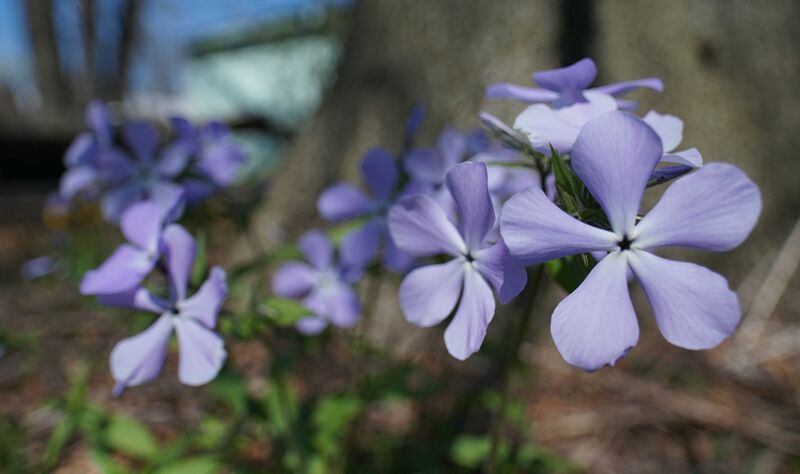 Woodland Phlox is one of our native plants welcomed by the horticultural industry. 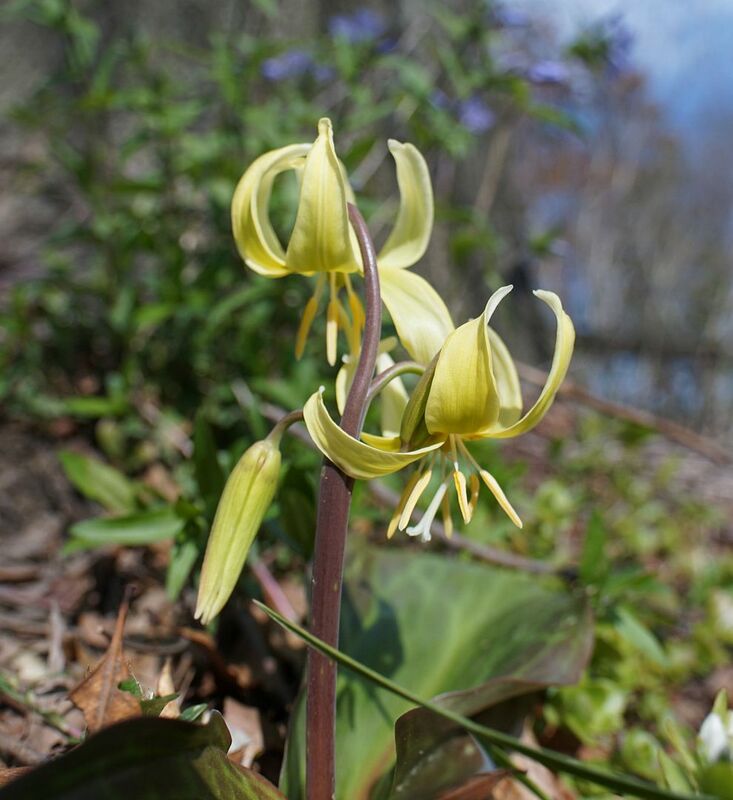 Many cultivars sold are actually quite fragrant and pleasing to have in mass. 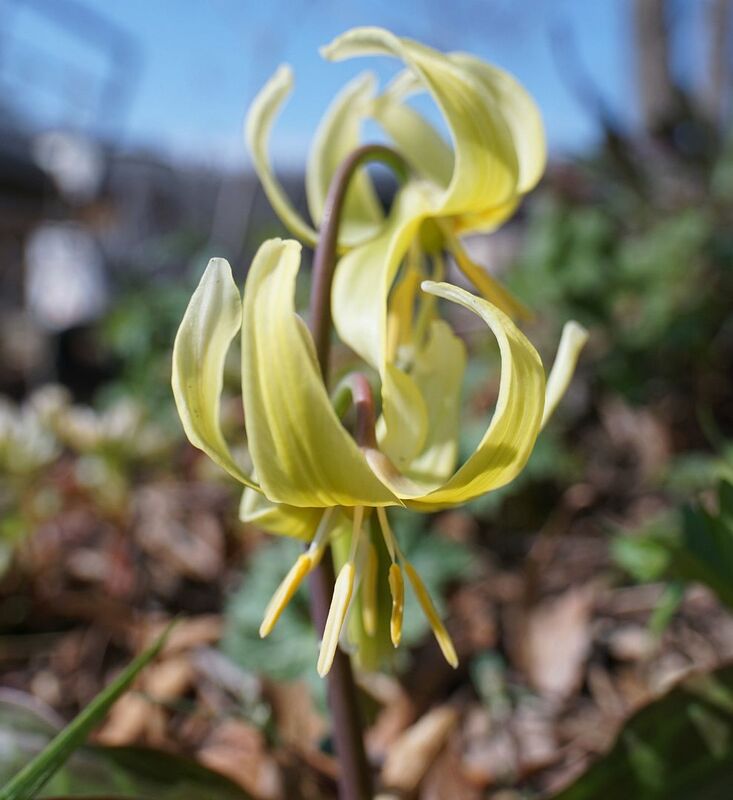 The Western Trout Lily is still going strong and many of the plants now have their flowers pointed outward making them easier to enjoy. 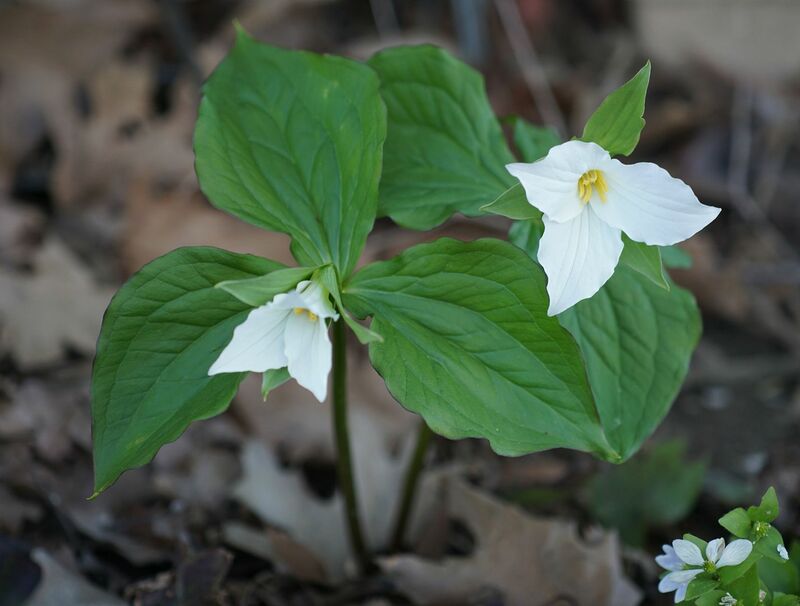 Trilliums have joined the show now and will be flowering for the next couple of weeks. Here the common Trillium grandiflorum is putting on a good show. Also I'm impressed that I was able to take this shot without the need for any editing. I'm not sure I like the effect though. 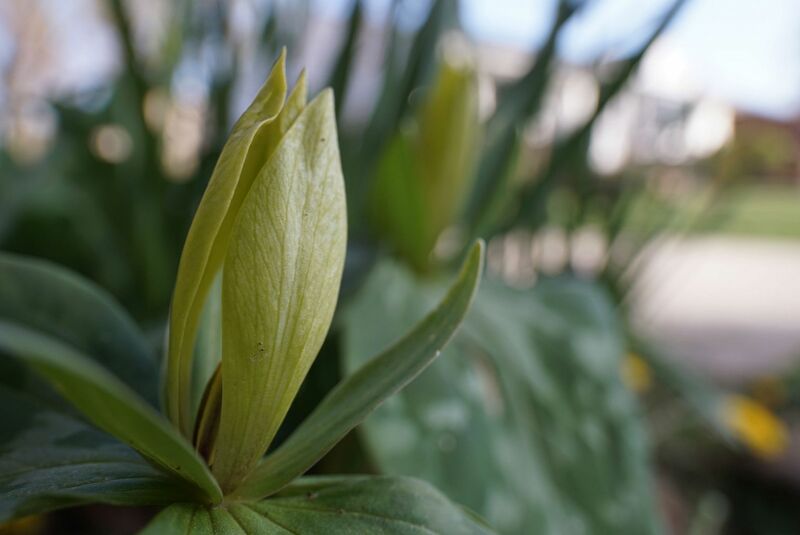 Trillium luteum has been going strong for a whole week now and the petals are starting to turn yellow. This is one of my favorite species because of its heavenly citrus scent. Despite the fragrance though, I've yet to see anything bother pollinating them. 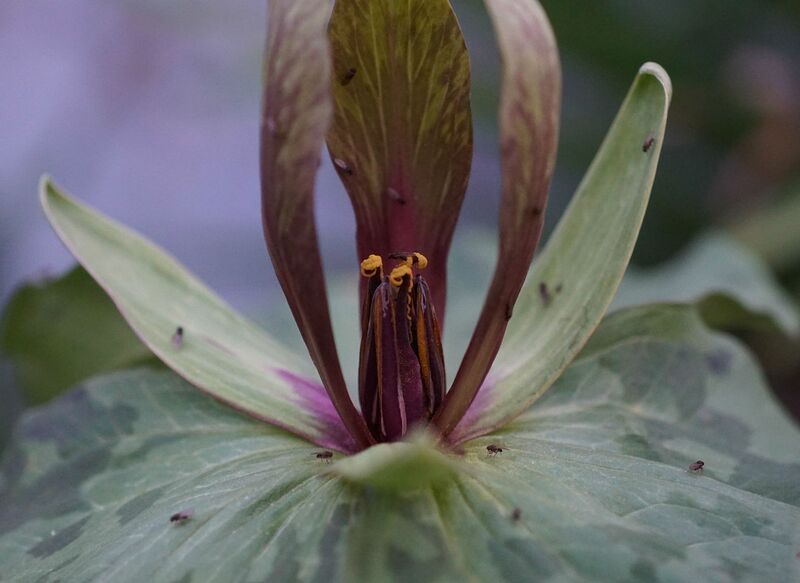 Trillium viridescens, from the Ozark, has no issues attracting pollinators what so ever. It does this by releasing a fowl odor I'd liken to rotting apples. It's not all that displeasing but it is very pungent. Paw Paw flower smell similar. Again only one of my trees has flowered, and a frost this year has killed a fair amount of the blossoms before they opened. Some that weren't as far along though survived the cold and are now opening. Stone Crop is a succulent ground cover that I'm starting to realize the charm of. For year I've tried getting carpets of Bluets to establish in patches of moss and under trees but to no avail. Stone Crop produces a similar effect, spreads more readily, and is far easier to grow! I've yet to see an pollinators taking a liking to them though but we're still early on in their blooming. 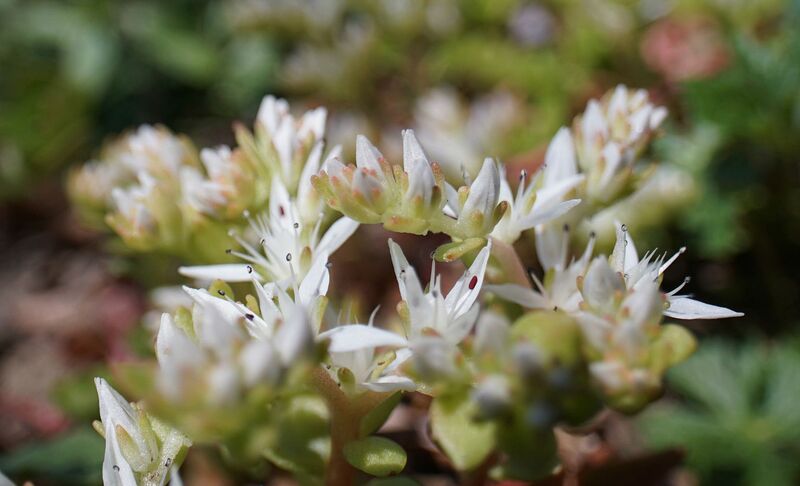 Normally Sedums get tons of pollinators to them, though mostly ones that bloom in the autumn. Hopefully I'll get a nice big patch of these going in a few years and I'll be able to see what they attract. 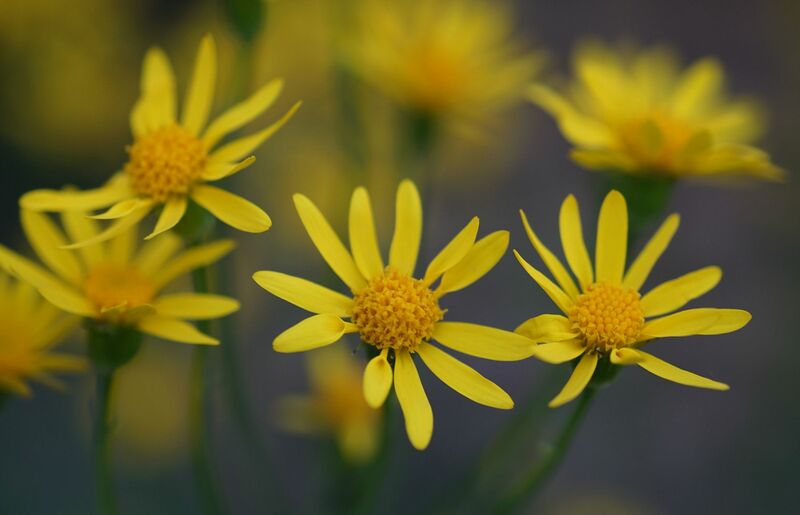 You'll be hard pressed to find a flower with such an intense shade of yellow that blooms happily in full shade as Ragwort. 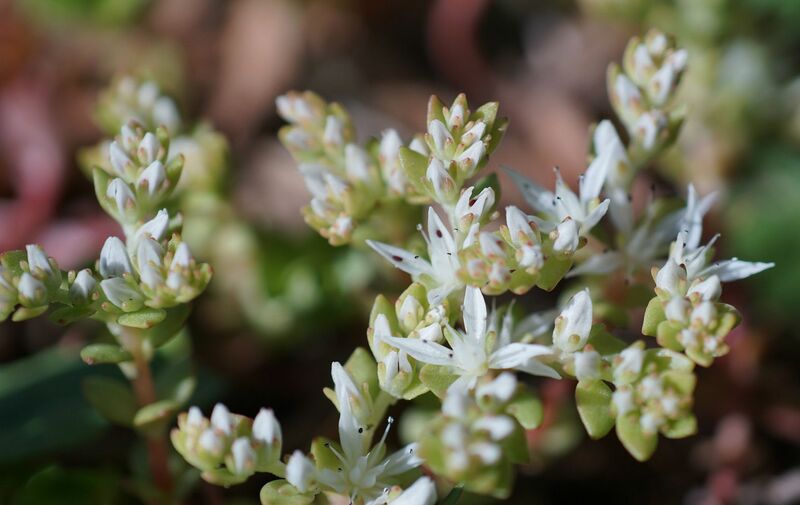 Despite the name, it's actually a very pleasing ground cover that gets a fair amount of pollinator action. Mostly its visited by flies but I see many sorts of small bees visiting them off and on, and even a honeybee or two now and then. 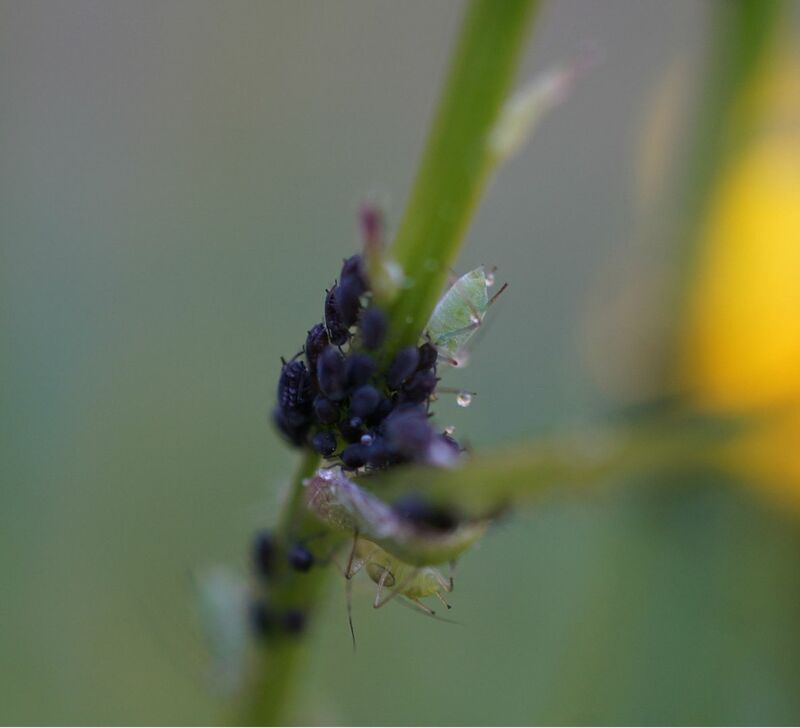 This year one of the patches has gotten an infection of aphids which I had never noticed before. I grow two or three species of this plant and they only seem to go after one of them. 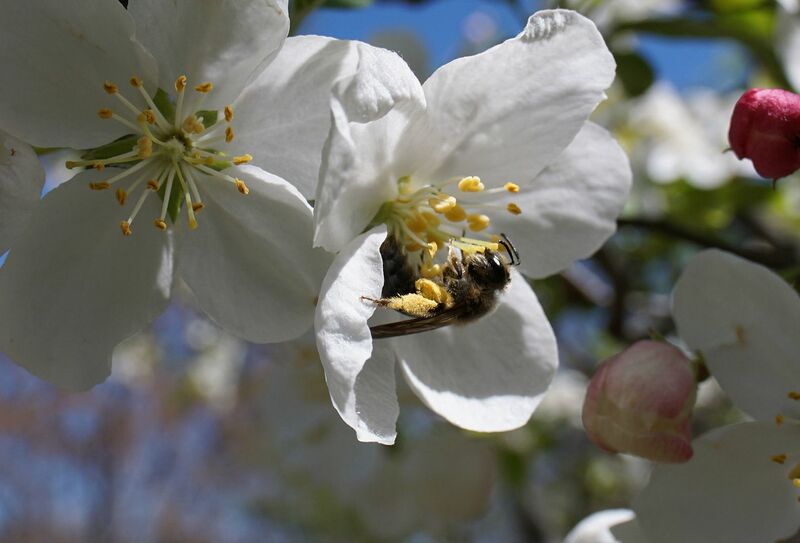 The apple trees are absolutely buzzing with all manner of bee at this time of year. 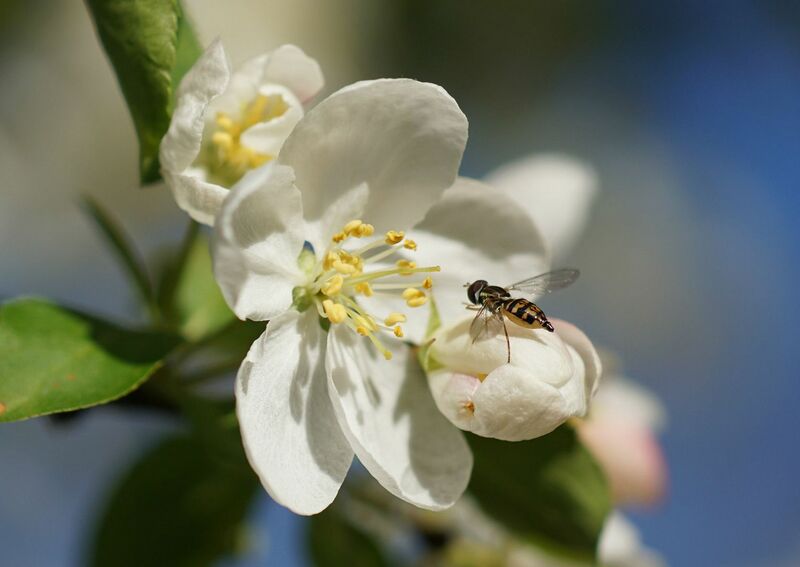 Beeflies, hover flies, carpenter bees (big and small), honeybees, bumblebees, mason bees, and an assortment of digger bees are all over the trees this year. 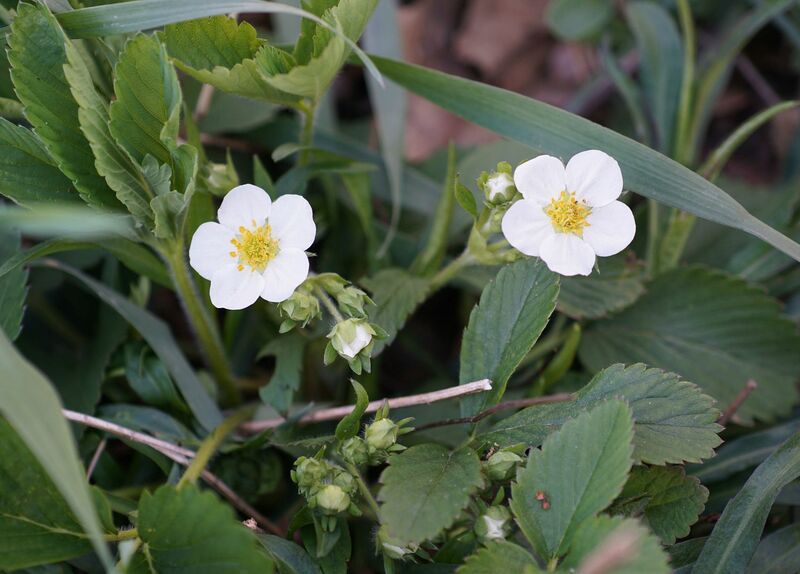 And lastly (for pictures anyhow) the wild strawberries I planted are starting to flower. 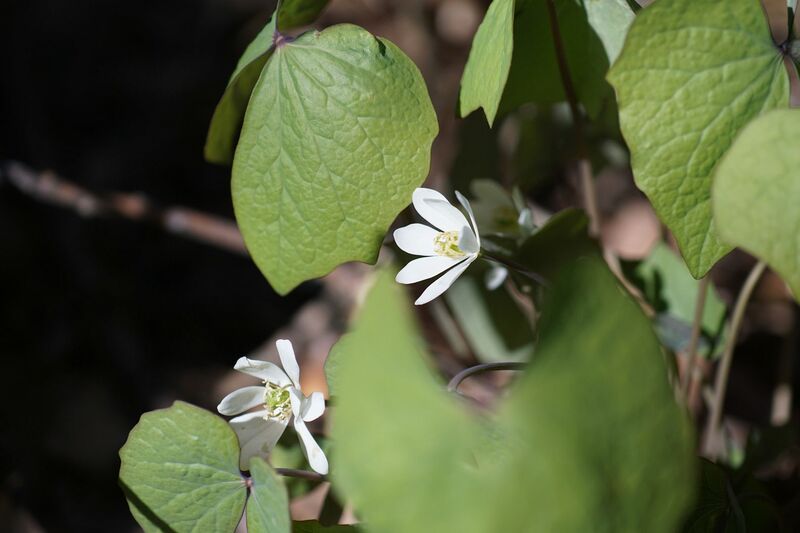 Jacob's Ladder, Woodland Poppy, Spring Beauty, Trillium flexipes, Foam Flower, and Virginia Bluebells are also flowering along with my Easter Redbud. I was out messing around with my new camera and lenses today. And I got enough good photos that I can reasonably tell a story with. 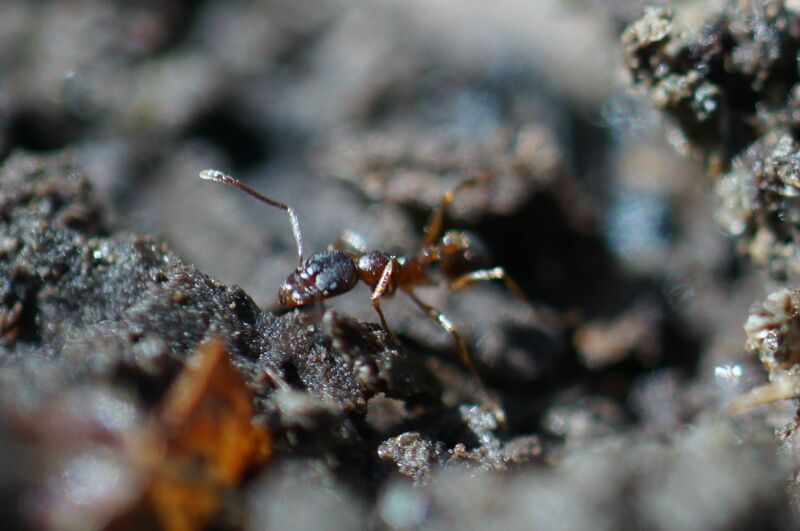 Pictured here is an ant, Apheanogaster rudis, which is a common "woodland" species though you can certainly find them nesting anywhere there's hardwood trees such as Oaks and Maples about. For years I've been feeding this colony Trillium seeds along with other ephemerals that engage in Myrmecochory, ant plant seed dispersal. Basically the plant has packets of elaiosome on the seeds which the ants find tasty and bring back to the nest, thus dispersing the seed away from the parent plant. As I said, with this colony I've been the one giving them the seeds. 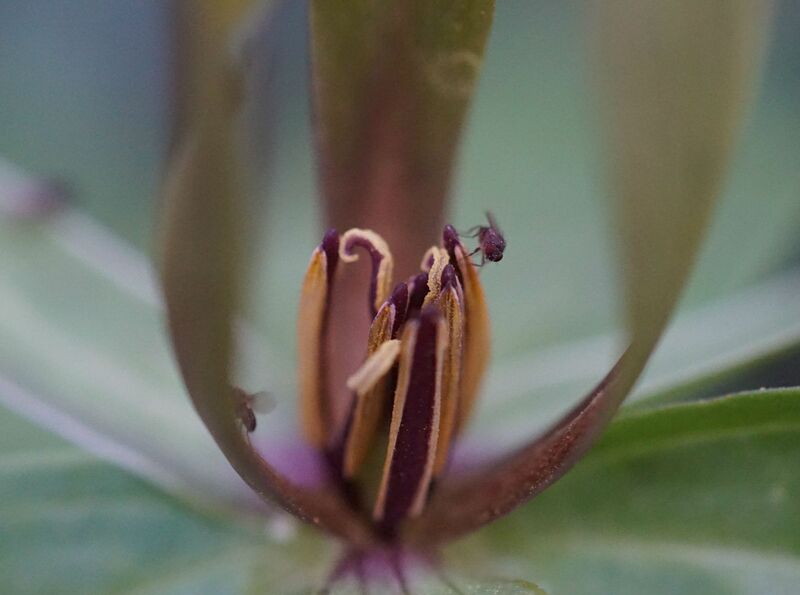 However, I've witnessed other colonies in my yard showing up to damaged Trillium seedpods and making off with them too, so it does happen naturally. For the purpose of taking photos though it's so much easier to just shoving the seed in the ant's mouth and saying "Hold This!" so I can get a shot or two of it. 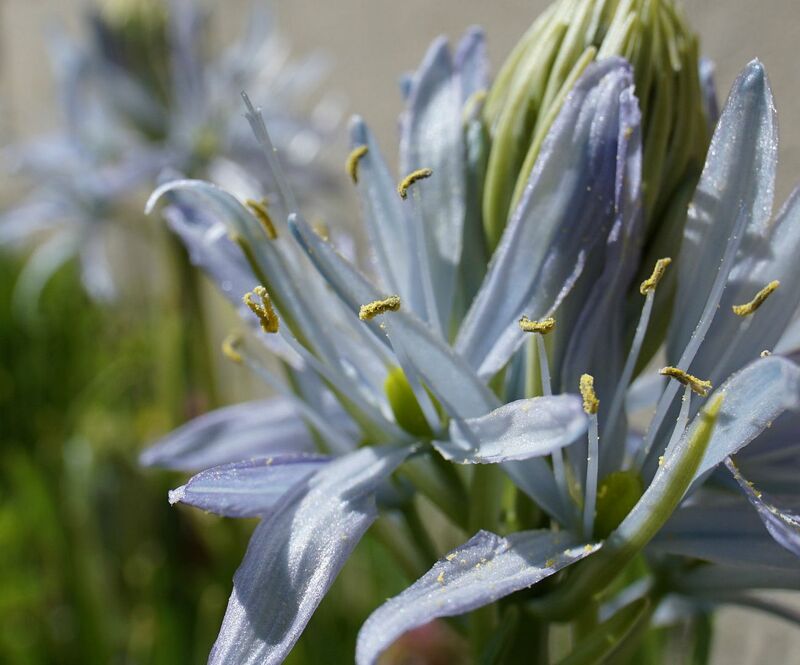 While Myrmecochory is a natural process, it is not a requirement for seeds to be successful. Gardeners can just as well plant the seeds themselves as they would a packet of tomatoes. They take two years to germinate, and the better half of a decade to flower after that, but the planting them on your own is just that easy. 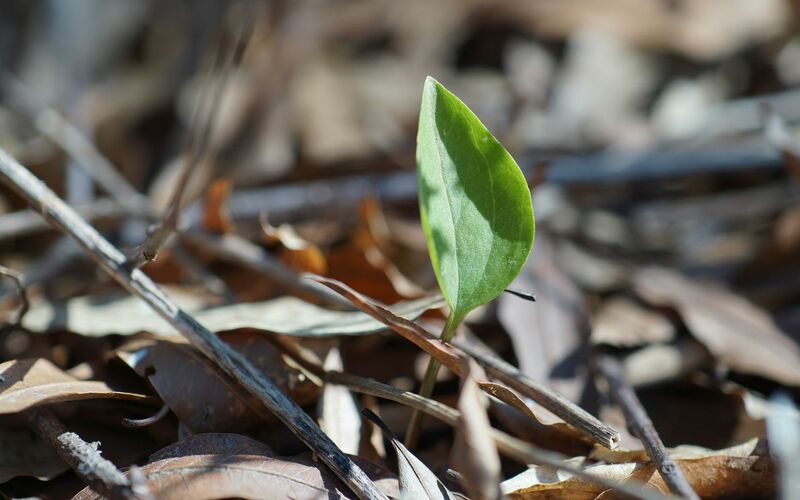 In nature though it's to the plant's benefit that these seeds germinate far away because their rhizome (root) is going to expand and send up new shoots to form a clump in a few years, and it's no good having tons of seedlings trying to grow in their way. 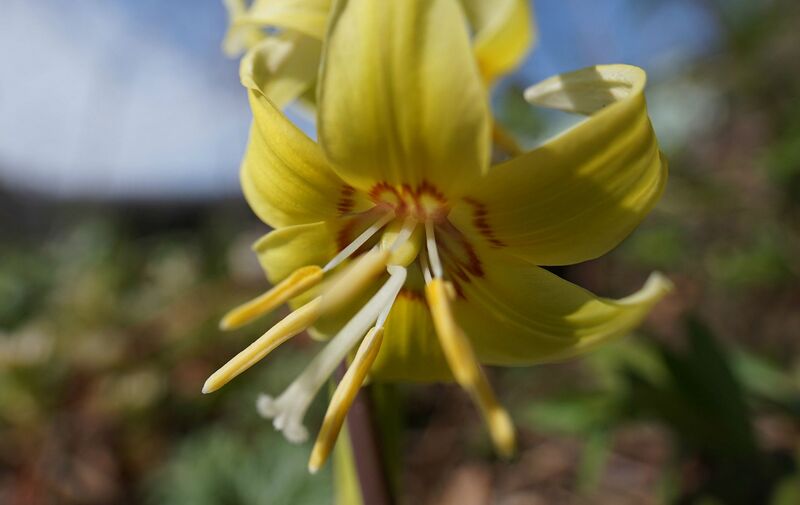 Actually it's even easier for the gardener to dig up the rhizome either while they're flowering or a few weeks before (Yes, while they're flowering!) and shake or cut the rhizomes apart that way. Each individual rhizomes wants to grow into its own clump anyhow so it's worth it to break them up every few years. Well, I checked the colony of Aphaenogaster rudis today and found this poking up right next to the nest. It's a first year Trillium grown from seed. They send up a simple leaf and that's it for the whole year. Next year it should be two leaves, and then three after that, and then possibly flowering or a second shoot after that and so on. It's likely in years to come I'll find more of these around the nest as I've literally been dumping Trillium seedpods on this colony for the past five years. 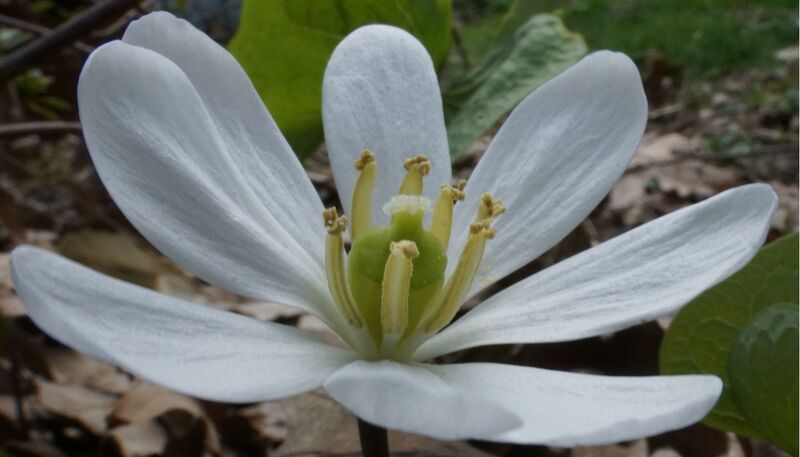 An issue though is it's not an ideal place for Trilliums to grow. It's just too dry in that part of the garden so even if they do flower, I'll have to work hard to keep them watered or they'll go dormant before setting seed. This is likely why I haven't seen any seedlings growing until now. Another thought is the soil might not have been right. We were always in the habit of removing leaf litter from the gardens, but in recent years I've started leaving the leaf litter where it falls, sometimes even raking it off the paths and right into the garden for extra winter coverage. In theory this should help build the soil as the leaves break down, and the new leaves added add insulation for the plants below. 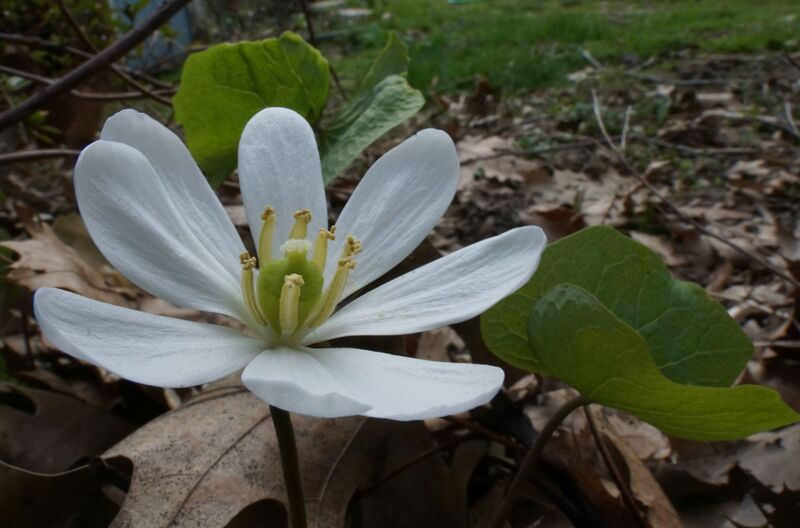 Another thing I'd like to mention is Blood Root. This ephemeral has been strangely missing from my garden. A few years back I bought a seed pack from Prairie Moon Nursery and tossed them out into the front garden. 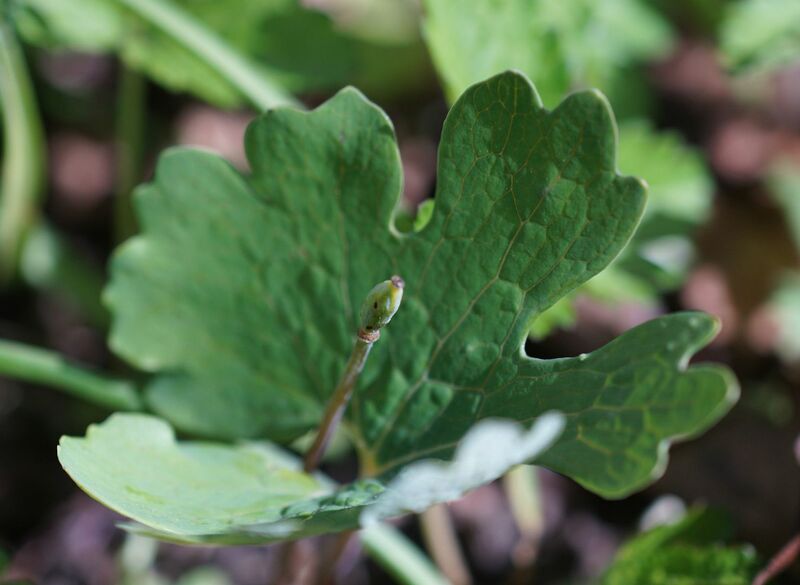 I hadn't thought anything of them because the leaves that came up last year were all the size of a dime, (tiny). Well this year it seems one not only decided to produce a great big leaf, but also flowered... and I missed it!